Among the comics I am most nostalgic about are the 100 page Detective Comics issues, and in particular the Outsider and Zatanna stories that ran in some of those. 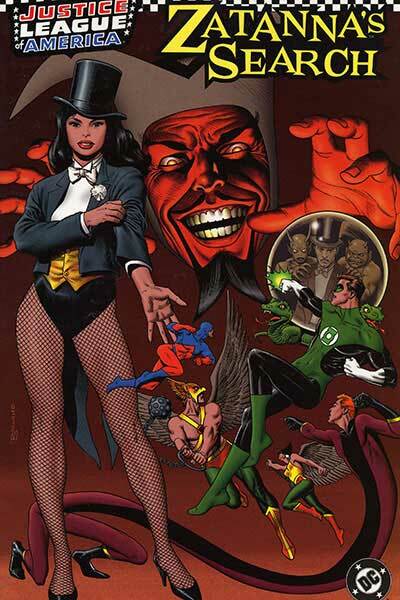 Detective did not reprint, that I can tell, all of the Zatanna story, though, and it was a long time before I could sit and read the entire tale, including the Batman and Robin adventure that was retrofitted in. I just bought and sat down with the collected edition of that wonderful set of guest appearances that established Zatanna to the world (Zatanna’s Search), and it’s a remarkable beautiful beast of a comic. Those early Zatanna stories, all written by Gardner Fox, possess elements I thrill to. They play with language and systems, they imply more than they explain, mad and powerful symbols and signs are thrown at the reader constantly, the layouts are dynamic, and the artists each bring a different set of tricks into play. Plus, Zatanna always knows more than the main character in each comic she guested in, though she too is, of course, ignorant of some things, and always searching for her lost father, the Golden Age superheroic magician, Zatarra. I love comics with multiple pencilers. Let’s just get that out now, because I know some of you run and cover your head at the thought of them. If one artist is exceptionally weaker than the others, that can hurt, and sometimes, it’s true, pencilers can go so off model it gets confusing, but these things can happen with a single artist, as well, who has a sudden lapse into a weak page, who forgot what they had drawn for the character just before and now they’re wearing something different. The strength of multiple artists, however, is that they can all work at a good speed and provide variation in techniques that might require more thought and time when one artist is managing it all. Joe Giella’s solid and iconic shadows, the different kinds of panel borders Mike Sekowsky draws for different scenes, the foreshortening and shot/reverse-shot that Gil Kane excels with, and the rough, important lines of Carmine Infantino could all come from one artist, sure, but they might not have come from any of those artists at one go, and any of them aping another, might mix the effects too much and make a mess of it. Each artist clearly working to their own strengths, with Fox’s scripts and Zatanna’s quest providing the throughline, highlight each the others’ powers. And Fox isn’t laying words over pre-plotted pages, here, but definitely scripting and moving every part to something bigger. Yes, the Batman story was originally written as unrelated, but even it has a “set of mythic challenges” conceit that is so very Gardner Fox. And that mythic sensibility, the metaphoric and symbolic potency of elements in each of the stories come together to provide a fugue of mad absurd loud magic and, also, a comic that feels like its characters have made genuine achievements. Batman and Robin have their senses taken from them one at a time as they face trials that would be easy with the ability to see or smell. Green Lantern must stop a blade his ring cannot, and then, after learning the secret truth of our universe, he must surrender his ring to an eternal evil. Elongated Man, Raph Dibny, is going to be late getting to his wife and has no way to tell her he isn’t just still parking the car. Ray Palmer, the Atom, has to accept magic, deal in magic, and then witness what he believes to be the exploding of Zatanna. They have not merely been put through the motions in “The Other Side of the World” or “The Girl Who Split in Two,” but tested and taught. Zatanna talks backwards to make things happen, as if the effort put into getting the words right in reverse adds to their significance. But this is only the base of all the communications gaming in Zatanna’s Search, with Zatanna beginning the comic speaking in half-utterances while split in two bodies. “I a Zat” she says to Hawkman, and to Hawkgirl, “m anna.” It’s not the most sophisticated code in the world, and indeed, it’s not meant to be a code, but symbolic of a woman divided, as she is, being of two bodies just then and of dual purposes. Zatanna is introduced physically divided, in dialogue divided, and trying to be two people at once. Zatanna is never about obfuscation, but about declaration and effort. Zatanna’s Search is crammed with wonderful symbolism and names of things shoved right at the reader with rarely any exploration of their significance or implications. Zatanna uses the I Ching to pull a woman out of a sword and then breathe her in. How does that work? It works. That it works is how it works, just as Zatanna explains the “other side of the world” as that place and time that is eternally and freely renewed. When Zatanna calls forth recreations of the Justice League, she casts a spell for them, of “yam eht doog stirips dia uoy!” that is given no further explication. They win the fight after she says it, so it must have worked. This isn’t magic of faith, it’s magic of recognition, and magic of trial and error. If one spell doesn’t work, try another. If one technique doesn’t work, try something madder. There’s a magic goblet stolen from the Hill of Tara, just off the edge of Ys, a land lost to use but not to the ever-renewable other side of the world that’s also right there. What does that mean? It means as much or as little as you want it to. Most of the superheroes let the new information they witness drift out of significance as soon as they’ve learned of it. Green Lantern learns of Ys, that his ring’s weakness to yellow can be circumvented, that an immortal evil has been imprisoned by paralysis for the rest of time (in a place that ought to renew him to mobility anytime/all-time), and he doesn’t really care. He flies off in the last panels of that story, declaring that while Zatanna will go on with her quest, he’ll “continue [his] fight against crime!” Hal Jordan, Green Lantern, is not here to learn and grow. He’s here to help Zatanna along in her quest. And as it is her quest, she learns from it, she grows, and he goes back to the Go square to play another round. The Batman story starts out with “There are no such things as magic or witches” on the same splash as a witch on a broomstick (who, we much later learn, is Zatanna in disguise, being puppeted by a supremely powerful villain – Alfred Pennyworth – into a stock witch of fiction instead of her true self, a real magician in the really real world of the DCU). The explanation for why the witch can perform magic while holding a special sort of wood is, itself, a sequence of words that really doesn’t explain anything much, except that it symbolizes an explanation and that’s got to be good enough. That some humans are born able to make amazing things happen by touching wood – but that is in no way magic – is no less or more plausible than the idea that the right person saying the right things backwards can make magic. Whether you understand or not, whether you can explain or care to, life moves on. You can learn or you can maintain willed ignorance, but things will keep on keeping on despite you or aside you. It works because it works.